2012 has started off so wonderfully for TheGardenLady. Among the reasons it has been such a happy start to the New Year is an email that I received the other day from a beautiful young girl from India who used to walk past my gardens and tell me how much she loved them. I would like to share some excerpts from the young woman who has allowed me to use her name. First of all, a very Happy New Year to you. Hope you remember me (the Indian girl who would walk around your lovely garden in the spring afternoons, we also spoke a couple of times). Being a plant lover, I will never forget your lovely garden and your passion for gardening. I still remember the beautiful sight of colourful spring flowers blooming out in your garden. I have captured many of them in my camera and plan to send it out to you. The pictures have come out as beautiful as your flowers:) Back in India, I shared the pictures with my friends and family and they loved it. I follow your blog and and liked the article about burpee seeds recently. One of my first [discoveries] about the flora in Pune, India is the abundance of the “Mirabilis Jalapa” flower. There are so many varieties of them blooming around gardens and households, Dark Pink, White, Yellow, two-tones etc..I am planning to plant one of the pink variety of the plant. I will also get some pictures for you to upload on the Gardenlady blog. Thanks again for the guidance about orchids. I plan to get one from the greenhouse. Since I am new to the city, I still have to check out good nurseries and plant options. Will share the progress on the plants at home with you on a regular basis. Regarding the Burpee seed catalog, unfortunately they don’t ship to India. I have to do some research regarding the horticulture societies around Pune. My house is an apartment styled one and I have two new plants. One is a yellow hibiscus and the other is a pink anthurium. I got the pink anthurium from a greenhouse I visited..it is still adapting to the new climate here at Pune. The Hibiscus, I just planted it last saturday. Wasn’t that a lovely email to receive from halfway around the world? I hope that TheGardenLady readers get such compliments on your gardens. Please share comments about your garden with all the readers. PS I have contacted Burpee seeds and they corroborated that they are not allowed to sell seeds in India. How sad. TheGardenLady has Mirabilis Jalapa flowers growing in her garden. 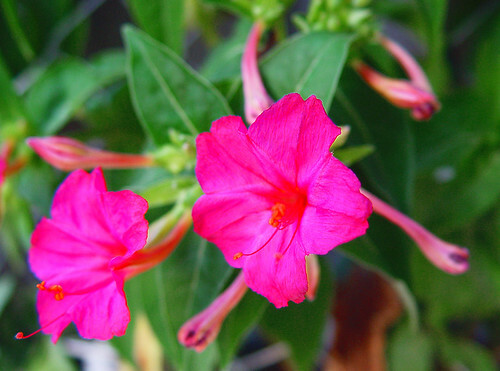 Their common name is Four O’clocks. They are rugged perennials and have surprisingly returned for me in hardiness Temp. Zone 6 for the last few years. i love to grow plants and enjoy everymoment , i love mirabilis jallapa, the vibrant colors, but i couldnt get the seeds and plants to bye in new delhi.